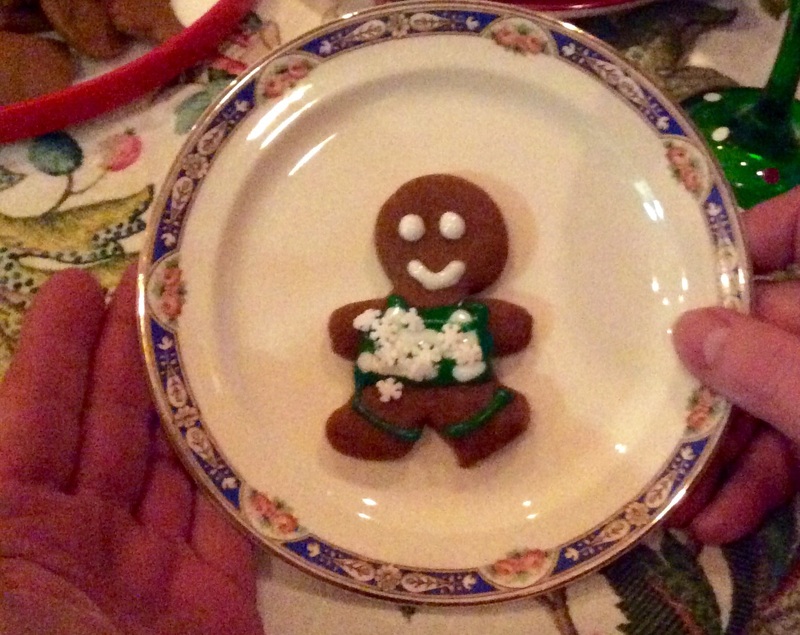 I’m not sure why but I’d never made gingerbread before. The recipes always scared me a bit. Maybe it was the molasses. 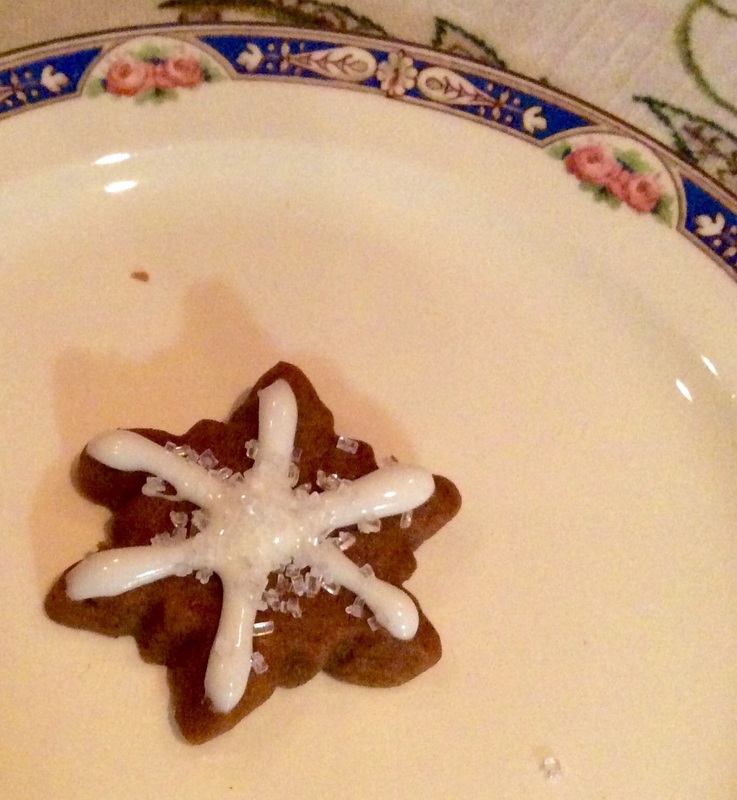 I do love it though–such a not-sweet cookie and so ‘holiday’. 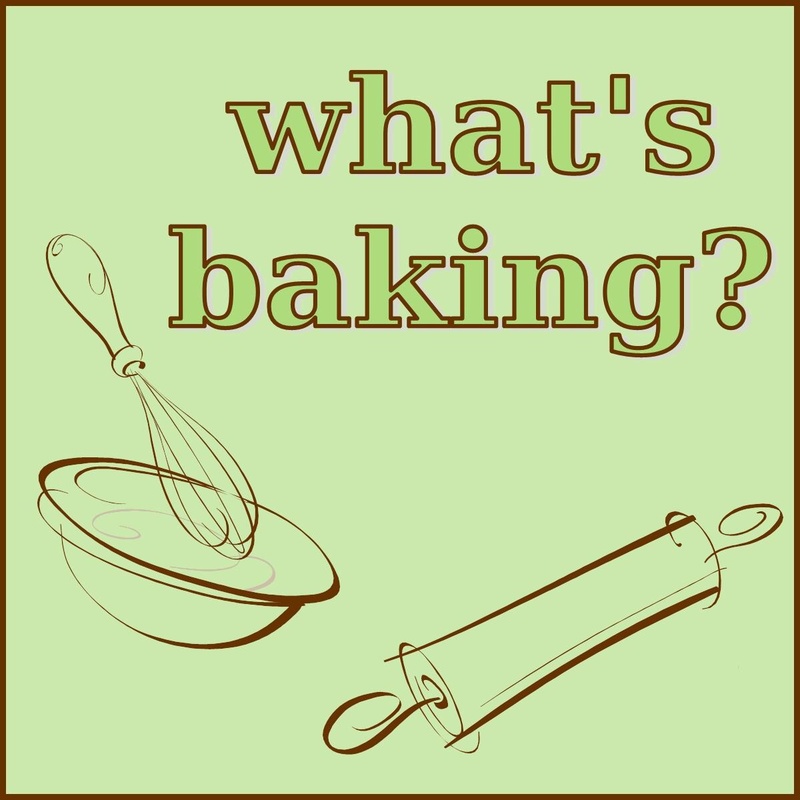 I was so glad (and somewhat terrified) when the What’s Baking group theme was revealed-GINGERBREAD! And you know what? I was afraid for no reason. They were so easy to make! Such a small ingredient list, a simple procedure. I’ll admit the first batch that I cut into man shapes ended up looking like aliens-but I figured out that it was because I rolled the dough too thin and it got warm. You need to keep your dough COLD. Really really cold. And keep it rolled to no thinner than 1/4 inch. While the recipe stated to roll half of the dough at a time, I found using only 1/4 was much easier for me to keep the temperature right. So have fun!! Fear not!! 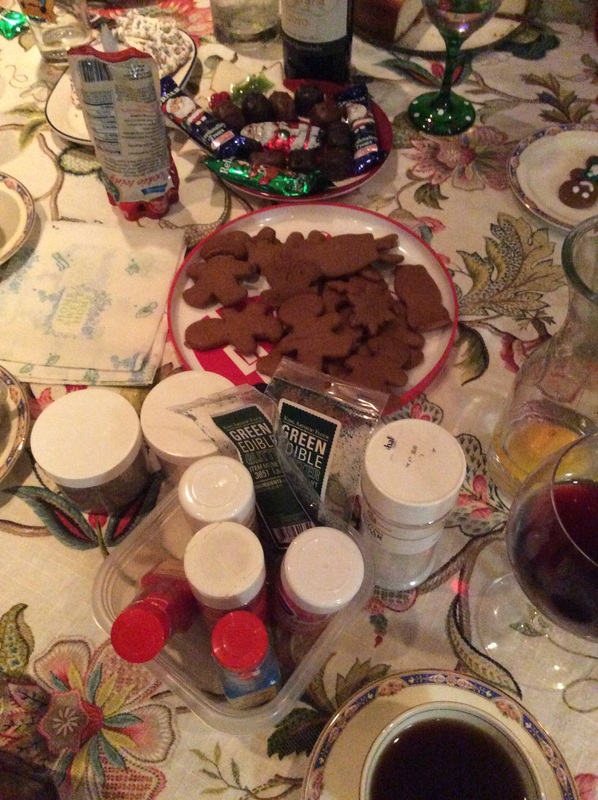 I didn’t get to decorate my gingerbread cookies. Since I was serving them as part of the dessert for my Christmas Eve get together I decided to let everyone decorate their own-how fun it was! 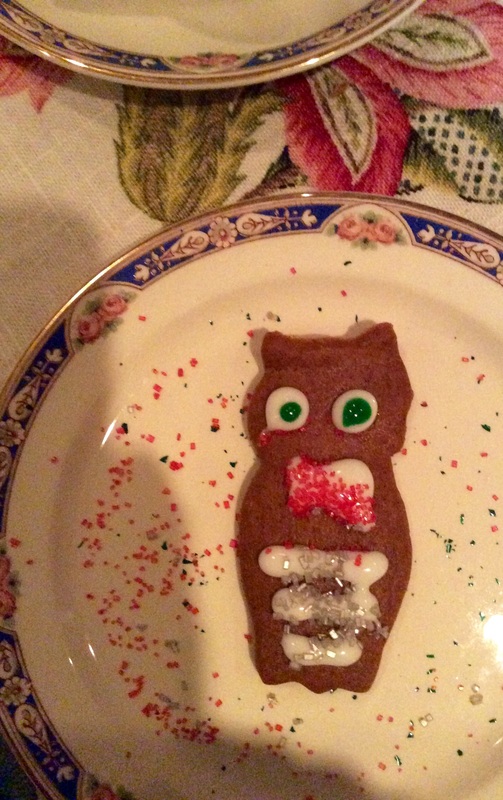 Since I’m not the best with decorating cookies it saved me some crooked-decorating humiliation too. Melt the butter in a small sauce pan set over medium heat. Stir in the brown sugar, molasses, salt and spices. Pour the butter mixture into a large mixing bowl and set it aside to let it cool to lukewarm. Then beat in the egg. 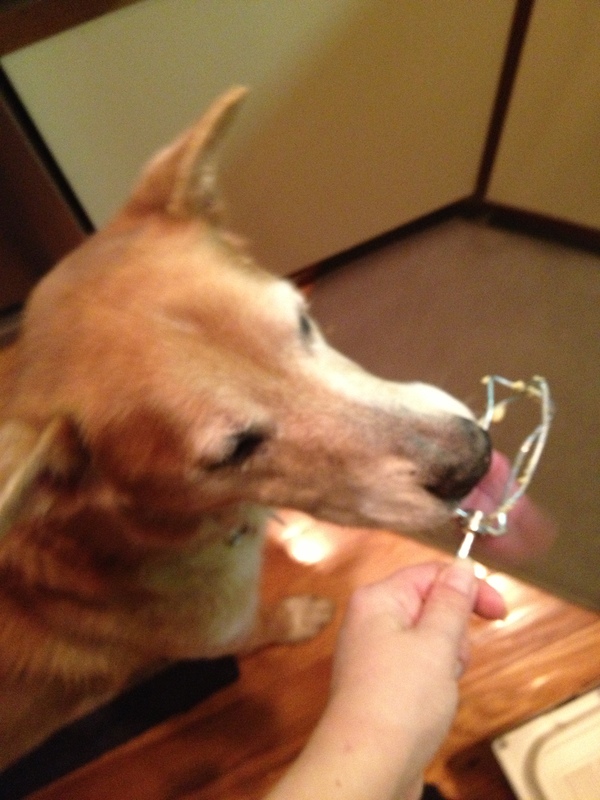 Whisk the baking powder and baking soda into the flour. Add the flour mixture to the butter mixture. Stir until completely combined. Don’t over-mix. Divide the dough into 4 even pieces and wrap each tightly in plastic wrap. Cool them in the refrigerator for at least an hour-but up to one day. Preheat the oven to 350. Line several baking sheets with parchment paper. When the dough has chilled sufficiently roll it to 1/4 inch thickness using parchment paper on the bottom and plastic wrap on top. Cut out shapes with cookie cutters and carefully transfer the shape to the prepared baking sheet. Reroll and cut the scraps or add to the batch in the fridge. Bake for 8-12 minutes or until firm. Mine took exactly 9 minutes as I like them a bit chewy. Let the cookies cool on the baking sheet for a minute or 2 then carefully (I use my fish spatula for this) transfer them to cooling racks. Once cooled completely you can decorate them. The cookies will keep for at least a week in an airtight container un-decorated. 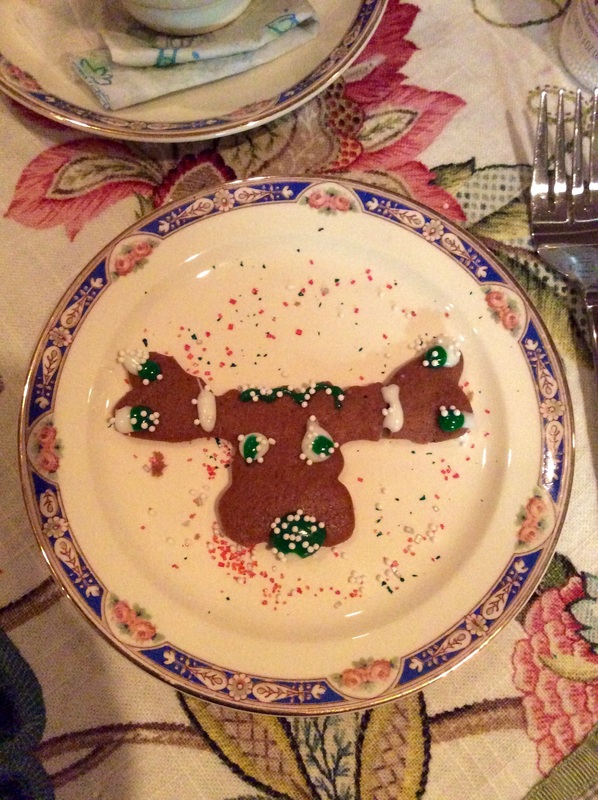 I used moose, owl, snowflake and the typical gingerbread man cookie cutters. They came out great!! Here’s the ‘make your own’ set up. Some sprinkles, some frosting pens…. Adapted from King Arthur Flour’s recipe. I’ve recently joined a great group of girls who take part in a monthly baking challenge. This month’s theme is ‘sprinkles’. Jen at www.beantownbaker.com hosted the challenge. Check out everyone’s dishes here. 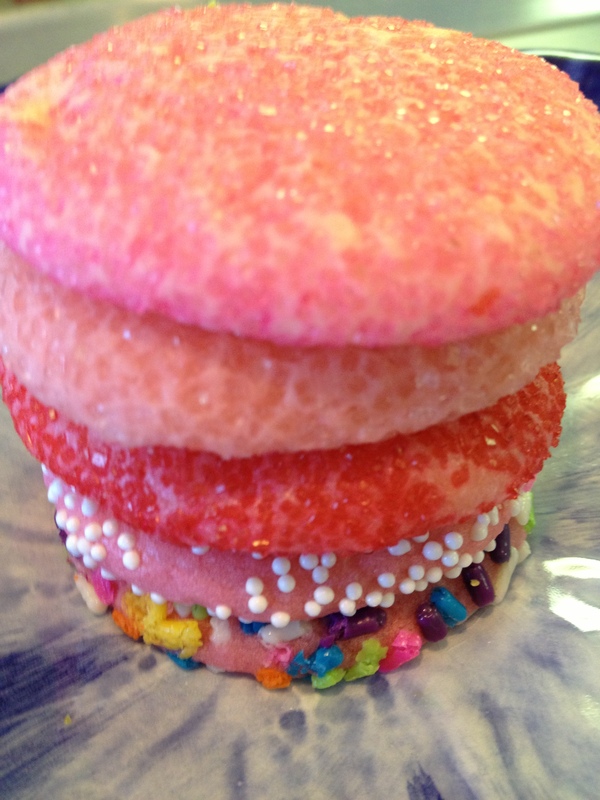 Recently I had seen a recipe online or in a magazine with sugar cookes that had a few different shades of pink for the cookie and different pink and white sprinkles. I believe they were also strawberry flavored (unless that was a different cookie). At any rate these are now a combination of those cookies. They were so darn cute! So I used what I recalled of those for my inspiration. Generally I use the drop liquid kind of food coloring but I guess that’s not made in pink because when I went to the craft store the guy told me that I’d have to get the gel and to only use a tiny bit at first. Boy was he right! It also helped me a great deal that Husband had given me some surgical gloves recently. 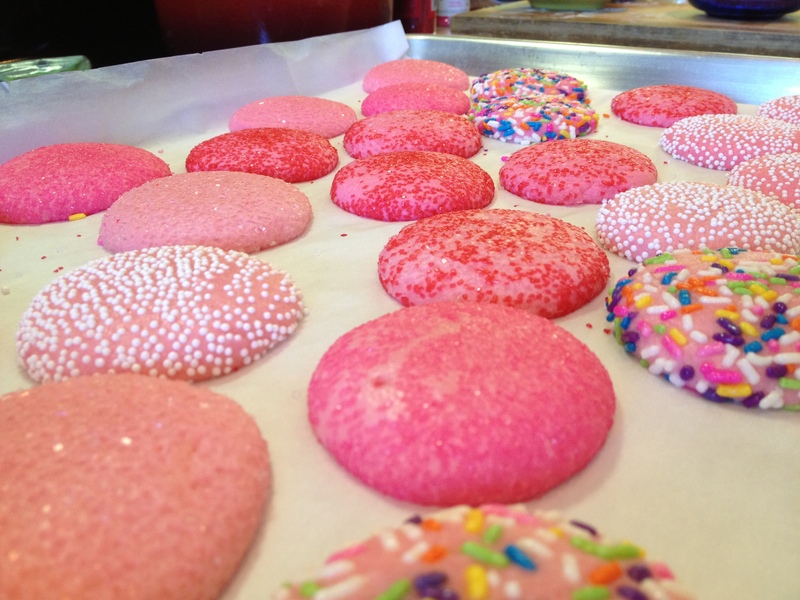 They were fantastic to use as none of the coloring or bits of dough were stuck to my hands after. If you can find some-use them. In a large bowl beat the butter and sugar until creamy. Add the egg and strawberry flavoring and mix well. Set aside. In another bowl add the flour, baking powder and salt. Whisk well to combine. Add the flour mixture, a bit at a time and incorporate fully, a little at a time. If the dough is too moist add a tad more flour and combine. 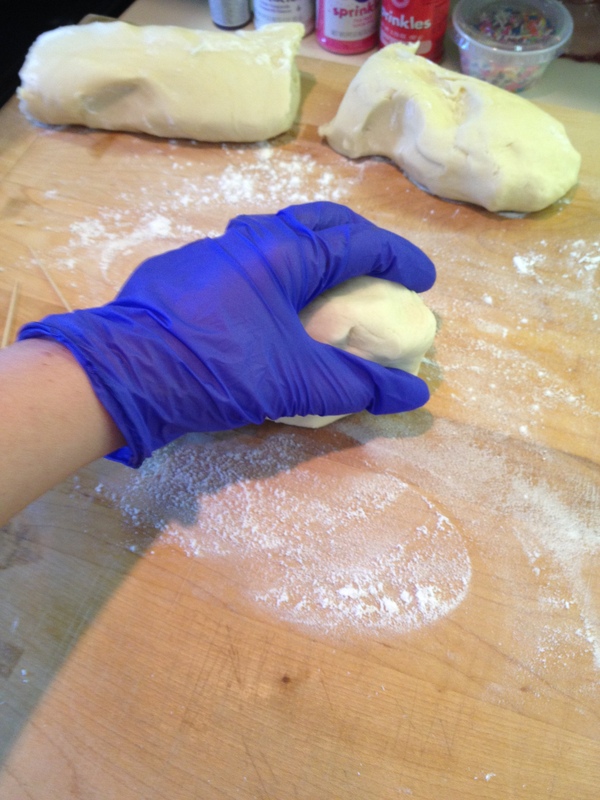 The dough should be soft but able to be rolled easily in the hand and not stick to your fingers when pressed. On a lightly dusted board roll the dough into a log. Divide into sections. 1 section for each color dough you’re going to make. I ended up with 3 (pic 1 below). Take the first section of dough and add the coloring, a tiny bit at a time, folding the dough over itself and then rotating to distribute color, until the desired color is achieved. Repeat for the remaining sections. Wrap each section in plastic wrap and put in the refrigerator for 15 minutes. Remove the first section of dough from the fridge. Pinch off a small amount and roll into a 1.5 inch ball. 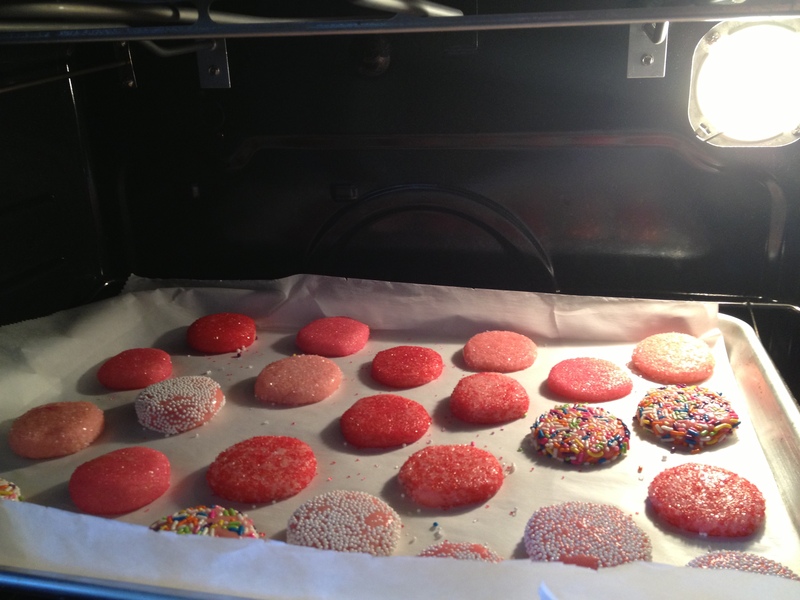 Roll the ball in the sprinkles you want to use and then place the ball on the prepared baking sheet. Place about 1.5 inches apart. Repeat until the cookie sheet is full. Using the bottom of a drinking glass with about a 2 inch diameter, gently press down the cookies until they’re all the same 2 inch diameter. Bake for 9-11 minutes. Remove from oven, set aside to cool and then place gently on cooling wracks. * to make super-fine sugar put granulated sugar in a food processor and process until super fine. 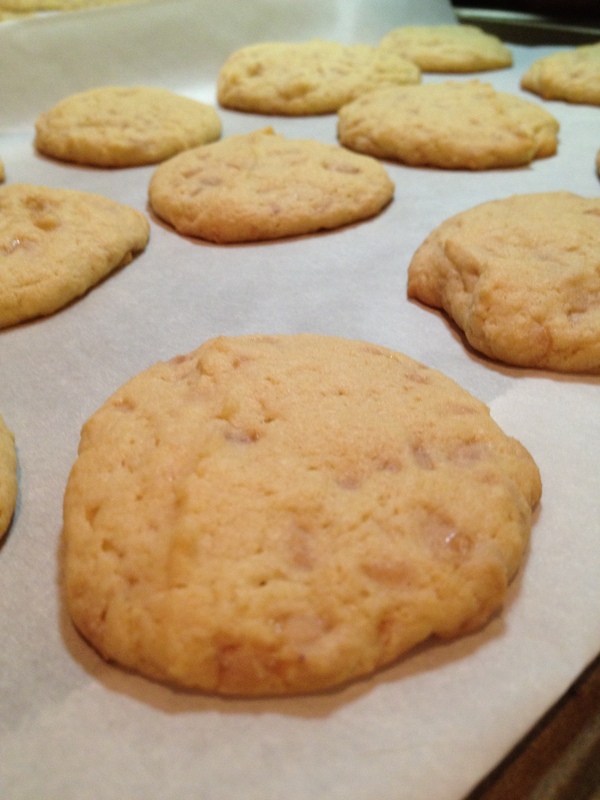 I had this recipe for the cookies in my huge binder of recipies I’ve printed out over the years. I have no idea where it came from. Over the holidays I had a surpise appendectomy while on vacation in Mexico so I can’t cook anything that requires lifting etc…and I need to lay around on the couch to recover. I’ve also been craving cookies since the surgery. One of my favorite candy of all time is the Heath Bar. While I was grocery shopping on Saturday I saw a bag of the bits in the baking aisle and decided to make the recipe for the Brickle Drop Cookies on the back of the bag. And the cookies are absolutely delicious!!! In a large bowl beat butter, sugar, brown sugar, vanilla and salt until blended. Add eggs and beat well. Stir together flour, baking soda and cream of tartar. Add gradually to the butter mixture, beating until blended. Stir in the toffee bits. Scoop heaping teaspoons of batter onto the cookie sheet, leaving about 1 inch between cookies. Bake for 8-10 minutes or until slightly browned. Allow to cook slightly on the cookie sheet then eat them. I froze half of the batter for these cookies so that I only made about 30. I wrapped the dough twice in plastic wrap, taped the recipe to the top and put into a ziplock bag. Slightly adapted from Heath Brickle Bag recipe.